I had to laugh at today’s “Two Leaf Clover“. 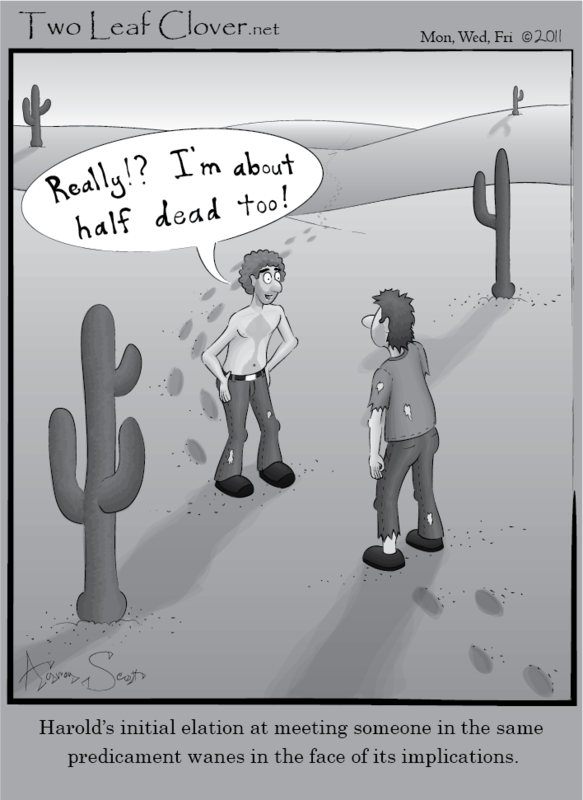 I’ve been in situations a few times (well, OK, not the half dead in the desert, but finding myself wondering if I were at the halfway point on a road to nowhere, and if it made sense to cut my losses and turn back or forge ahead). Many times when we “go exploring” in an application, we find information at every turn. That information may be good, it may be bad, but it’s still information that informs our decisions. The challenge comes when were not sure if or how we are going to proceed. There have been many times when my “gut” told me I should continue down an avenue of action, only to find out that it didn’t give me the information I was hoping for. Another way to say this is “be careful when you start climbing a ladder; you don’t want to reach the top to find out you put it against the wrong wall”. Is it possible to hedge your bets and determine if you are going down a rabbit hole, or is it inevitable you will have to power through whatever you are doing to see it through to the end? The truth is, there’s a time to have the discussion about going down a rabbit hole, and that’s at the beginning of the negotiations. This is where doing good estimates is important, and having the ability to speak to how much time and how much money we will have to spent to accomplish a goal. Making adjustments later is often a lot harder, and it’s really a challenge when you get close to a release and you realize that you have a lot more that has to be done, and not enough time to actually do it. We often double down at this stage and we push through to do whatever we have to do, often making ourselves exhausted, run down, and irritable… and very rarely is the result worth it. We don’t get better testing done when we double down. In many cases, we actually do worse because we are not sharp and we are stressed out trying to cover our bases. So as you might guess, my answer for “are you ready to double down?” I hope the answer is “no”. I don’t want you to double down on a bad bet. Instead, I want to encourage you to focus on covering the highest risk areas and getting the best information you can in the time you can. By doing that, you can let the product managers and the other members of the team with a vested interest make a decision towards what needs to be done. Testers going on death marches aren’t going to get us good information, unless the information we want is to find out how to learn the most effective way burn out our testers. If you’ll forgive me, I don’t really want to know how to do that.